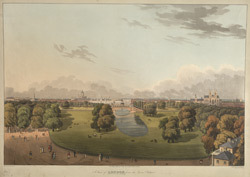 View from Buckingham Palace overlooking St James's Park. This brightly painted Chinese style bridge spanning the canal was built during the 1814 Peace festivities to celebrate the end of the war with France. The bridge originally had a splendid seven-storey pagoda perched on its middle. The pagoda disastrously caught fire during the inaugural fireworks. However the bridge was a popular public spectacle and remained until 1825.